This terrific Tasmanian honey deserves a page on its own. When it was mentioned as one of my most favorite varietals from Australia and described as a floral varietal that people either swear by it or swear about it, many of our visitors became very curious about the taste. It is an acquired taste; so those whose taste buds are usually more tuned to mild honey tend to have second thoughts about giving it a try. Those who did, never regretted it. 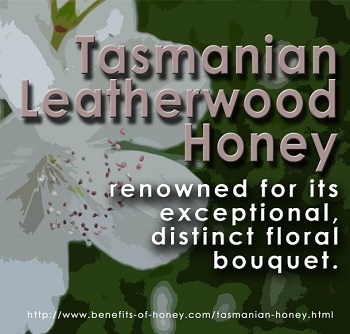 It's the Tasmanian Leatherwood Honey. Sourced from Australia's island state, Tasmania, which boasts the world's cleanest air and water and has some of world's most primitive and ancient and unspoiled forests, this honey gets its name from the leathery textured leaves of the Leatherwood Eucryphia Lucida. A mono-floral honey (which means it is not blended with other floral honey), Leatherwood honey is renowned for its unusual floral bouquet. It possesses a fragrance like no other and a taste which no adjectives can adequately describe. Place a blob in your mouth and your senses are instantly awakened by the piquant perfumes of the Leatherwood blossoms. The aroma is robust, yet so lovely and pleasing to the palate. Traditionally, this Tasmanian honey has also been used as a cure for hang over. Its naturally rich occurring vitamin B and minerals aids in recovering from the excessive alcohol quickly. The depth of its flavor makes it a fabulous spread for bread, toasts and waffles and perfect match with cheeses, cordials and teas. If you are an avid Earl Grey tea drinker, chances are that you would also take to Leatherwood honey. Just as Earl grey tea stands out in the world of tea varieties, this exceptional honey too sparkles in comparison with other floral honeys. Both are varietals with a character. However, as each has a bold presence and its own distinct flavor profile, blending the two can be tricky. To fully appreciate the subtleties of Leatherwood honey, it's best to choose a tea which is milder and neutral to go with it. However, in any adventurous pairing of foods, anything goes; rules are meant to be broken to create complex mixtures of flavors desired. A typical response from newbies to this Tasmanian honey is "I've never tasted anything like this before. It's very special." 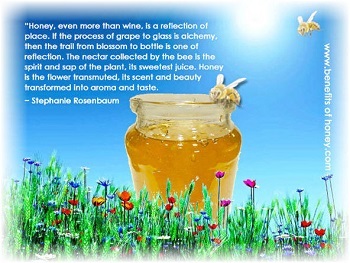 "Like red wine is to grape juice, Leatherwood honey is the red wine of honey", an apt analogy I come across online, speaks of the how unusual Leatherwood honey is compared to other traditional honeys. Leatherwood trees are indeed special - those under 75 generally don't flower and thus have no nectar source. The most prolific flowering trees are more than 100 or 200 years old. In the recent years, severe logging has also put the Leatherwood trees under much threat. It's no wonder why it is recognized by honey connoisseurs as one of the finest and rarest honey in the world. It is an irreplaceable honey and definitely one which is worth another glance if you have never considered it. 1. If you are residing in Singapore, check out the Leatherwood honey in: Bee Healthy. 2. If you have never liked honey or believed that it tastes good, this page may just change your mind: Taste Honey? No Way! End of "An Irreplaceable Tasmanian Honey". Back to "Exploring Honey Varieties!"